Of all of the worries that would be floating around your head in a survival situation, getting food is certainly going to top the list. Yes, you may be well-aware that food should be an area of negligible concern. You may even be shaking your head right now at the presence of yet another survival food post when you know people should only be worrying about finding water and shelter. Of course, your body isn’t going to cooperate as readily as you may hope. Think about when you are at work and begin to get hungry at around noon. How easy is it to focus on other tasks when your stomach is gnawing away at you? And that’s only after maybe six hours without eating. Sure, you can survive three weeks without food, but at least a week of that time would be spent unconscious from the onset of starvation. After squaring away other tasks, getting food should be a huge concern to keep you busy and keep up your moral (if you catch something). To make that even easier, you should focus on easy and nutritious prey, like fish. 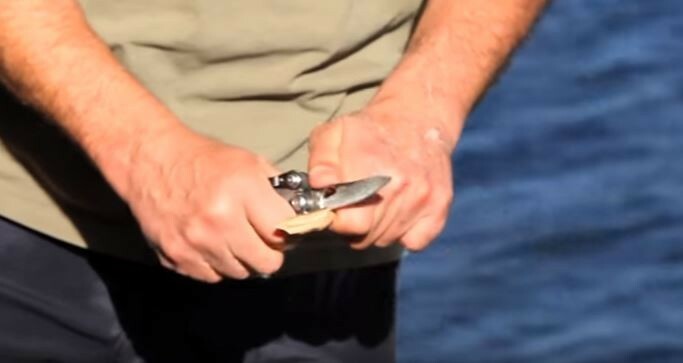 With this handy trigger for a fish snare, this task has never been easier. Learn how to make one by watching the video after the break.